City Light Guide, a free mobile app by Philips has just been released. Here, visitors and inhabitants of Barcelona, Berlin, London, New York, Paris, Rotterdam, Shanghai, Sydney and Tokyo are invited to follow routes — through photographs and narrative — put together by lighting designers including Paula Rainha from Portugal, Thomas Wensma from Netherlands and myself. My contribution New York City — a sliver of Manhattan– is an easy walking tour. No fuss, no transportation. 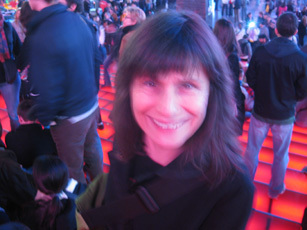 A 360-degree view of Times Square and its private light phenomena and then on to Bryant Park. Look South – 42nd street view corridor. Bryant Park: East Allee: view southward to Bryant Park Hotel (American Radiator Building). New York City’s borough of Manhattan has been celebrated and embellished in the all of the arts, high and low – song, cinema and poetry. Consequently much of the world “knows” this uniquely dense metropolitan island. With a population of over 16-million within 59 sq. kilometres, historically, the city has attracted immigrants worldwide, leading to a richness of cultural diversity reflected in distinct neighbourhoods, cuisine and languages spoken. Prior to the appearance of the Dutch in 1609, “Manna-hata” was populated by the Lenape Indians. Since the late 19th century the Manhattan skyline’s iconic skyscrapers have shaped its identity. Today, the city is known for architecture, fashion, the arts, and financial activities. As the “city that never sleeps” it is a perfect candidate for a Light Guide. Times Square has been called the “crossroads of the world”. Perceptually there are now two crossroads within Times Square. One, the actual crossover of Broadway and Seventh Avenue (between West 44th and West 45th Streets), by the diagonally crossing avenues, and, two, a folly, a grand stairway of glass at West 47th Street. The observation deck doubles as a rooftop for the TKTS discount Broadway theatre ticket booth. This landmark employs cutting-edge technology for lighting and mechanical systems (including geo-thermal heating). LED arrays concealed in the steps create a saturated unmistakable red glow. The grand “stairway to nowhere” is a huge success, fully occupied by New Yorkers and tourists alike. In 1686 the area which is now Bryant Park was designated as public space. Subsequently a graveyard (1823) then Reservoir Square (1847), it was renamed Bryant Park in 1884 for newspaper editor and abolitionist William Cullen Bryant. In 1899, the Reservoir structure was removed for the construction of the adjacent and underground New York Public Library. The park was re-designed in the 1930’s as a Great Depression public works project. In 1969, a famous rally was held as part of the nationwide Moratorium to End the War in Vietnam, and then in the mid-seventies the park became derelict. In the 1980’s through advocacy and formation of a Business Improvement District the park was redesigned and renovated. Pivot to a recent think-tank experience with LAND Studio to discuss the visitor experience of this great industrial, mid-western city. I arrived the evening before and commenced photographing – this is what I do! My handy iPhone, iMovie editing-app called out: “try me“. So I did. And the next day eyes opened to the vernacular and artistic figures of light in Cleveland. 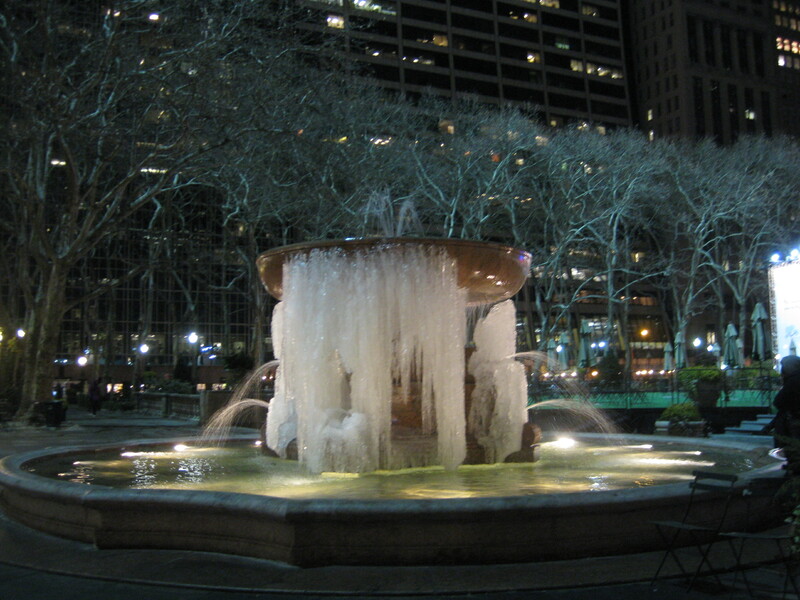 For other cities’ subject videos, photos and text; see articles in this blog: CITIES! 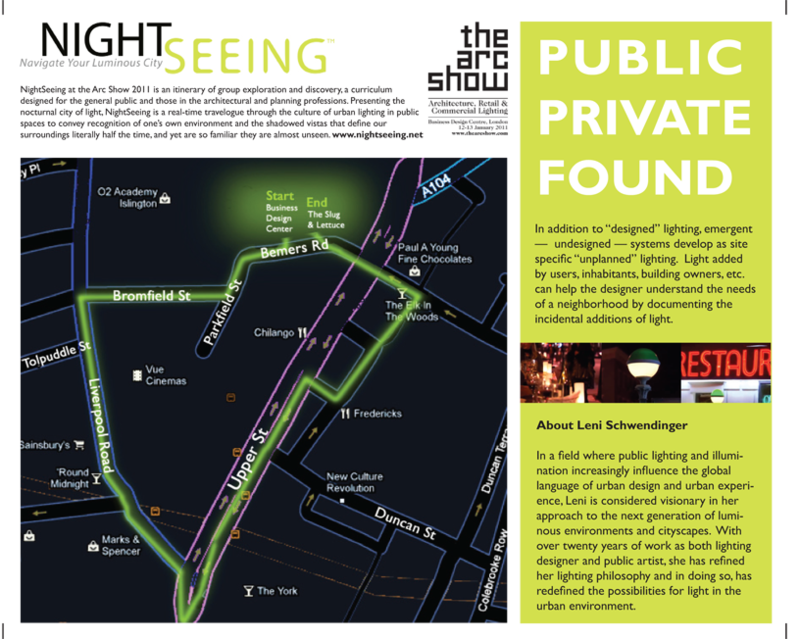 The NightSeeing program’s intention is to open people’s eyes to an existing nighttime milieu, as well as providing an overview of public lighting theory in an experiential setting. 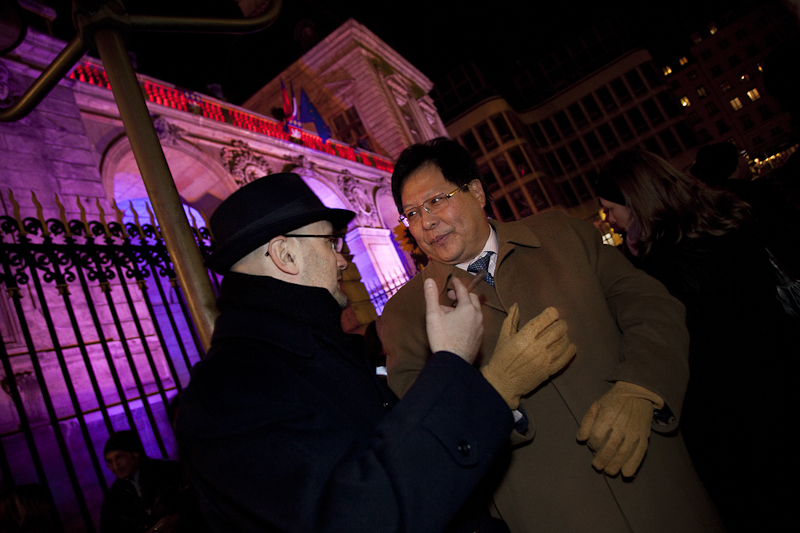 NightSeeing was presented on January 11th, 2011, as part of the Architecture, Residential, Commercial (ARC) Lighting Show in London. 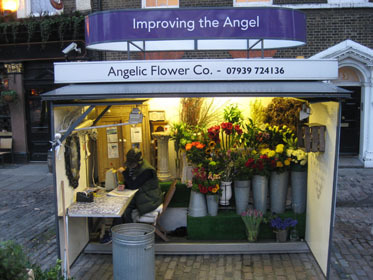 This interactive experience was a guide to the nocturnal lighting environment, culminating in an hour-long evening walk through The Angel, Islington district. Prior to the program I worked with the hosts on a virtual event preview to brief conference attendees for registration. (links to Preview Part 1 and Preview Part 2). NightSeeing London consisted of two parts. The first section comprised a LightTalk during conference hours, providing a basic understanding of the systems lighting our cities. The second aspect, LightWalk, was the after-dark walk, in which I decoded the shadows, emanations and reflections that defined the nightscape—from shop silhouettes and signage to streetlights and the phantom photons of passing cars. Numbering approximately 50 participants, , we started off from the Business Design Center – equipped for the London weather with glowing umbrellas, a gift from Lighting Alliance/UK. As the group explored the rain-whipped streets of The Angel in Islington—amid the pulsing neon and Saturday night pedestrian and vehicular traffic—the attendees’ many observations and insights created the atmosphere of a movable symposium on the after-dark urban environment. Among the significant features of The Angel we focused on were the distinctions between two of the district’s retail sites. N1 Centre, with the glare of stark white-metal surfaces and shop fronts, was offset by illuminated public art. Camden Passage was distinguished by its handmade surfaces—especially its painted signs and the charming window displays. In one instance, the reflection of high-pressure sodium light from a lettered sign created an illusion of gleaming gold. I was pleased and astonished that the attendees at the ARC Show NightSeeing™ were from many nations— including South Africa, Serbia, Germany, Netherlands, France, Norway, and of course, the UK. Moreover, The Angel event was for me, personally, a kind of homecoming. In the 1970s, I resided in North and East London for a number of years. Bicycling to Camden Passage and the Chapel Market, in the Angel, and riding the 73-bus and the Northern Line are reference points in my memory of London. I attended London Film School in Covent Garden, and learned to be very observant of a fully sensorial London with its familiarly welcoming sounds, sights and smells. What a privilege and pleasure, then, so many years later, revisit these environs, and to be in the Angel as an interpreter to of the after-dark streets. Here, on YouTube, video of the actual LightWalk courtesy ARC Show’s partner UBM Interiors, Part 1 and Part 2. 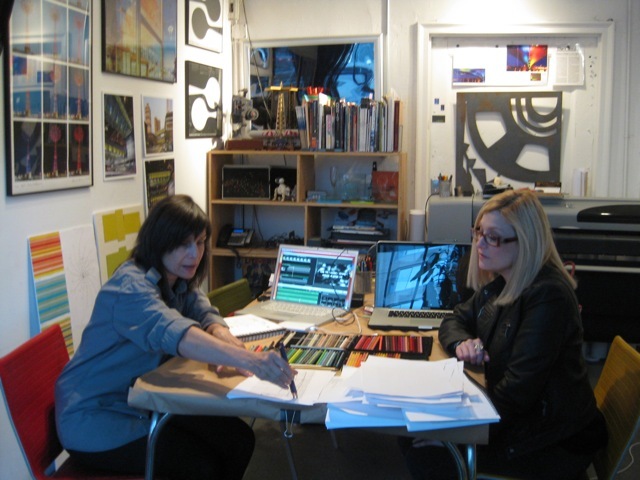 The idea for the NightSeeing program originated with a class I taught—at New York‘s Parsons School of Design—in which we would explore urban environments at night. As soon as we walked out the door there were things to contemplate and discuss. The smallest pixel of light turned into a subject. The excursion became like a treasure hunt, a way of recognizing both “found”, existing light and designed light. From these modest beginnings, NightSeeing evolved into site-specific itinerary for the benefit of lighting designers who work with architects, landscape architects, engineers and other urban design professionals illuminating city structures and locations. The NightSeeing programme focuses on an ever expanding variety of luminous possibilities. My personal dream is to take NightSeeing™ to 50 cities in two years. NightSeeing™ is a trademark of Leni Schwendinger Light Projects LTD.
All photos courtesy Andy Spain Photography except where noted. Video of the actual LightWalk, Part 1 and here, Part 2. Blog articles, including Times Square, Lyon, Washington D.C. I was thrilled to receive a message from Dietrich Neumann, whose “Architecture of the Night” has inspired so many. He indicated that he had hoped to attend the Bryant Park, NYC LightWalk one year ago, but had been waylaid, and that now, very soon, he planned to bring his students to Times Square… and wouldn’t I take them on a LightWalk? As serendipity would have it, I have been studying the Square, for the Light Projects role as lighting consultants for the Times Square Pedestrianization project on the Snohetta-led design team. Times Square is only zone that I know of that has a minimum lighting/signage requirement which has resulted in the mandate of brighter is better. Here are large scale panels of light communicating in an ever-advancing, electronic graphic-design language. The effect is awesome, that is, mesmerizing – a free drive-in movie on foot. The billboards of 20th century Times Square were more dimensional, formed and handcrafted. Novelty is still an important part of the light signs, but the novelty resides in graphic code and the signs are flat or skinning the facades of buildings. This Artkraft Strauss “Vintage Times Square Signs” video from 1920’s to 1960’s illustrates the technological shifts in sign design. And from the New York Times, 2006, the denouement; an auction of signs and design sketches; Neon Nostalgia From Times Square to Be Sold by Sign Maker. “The days of the handcrafted neon spectacular are pretty much gone with the 20th century. 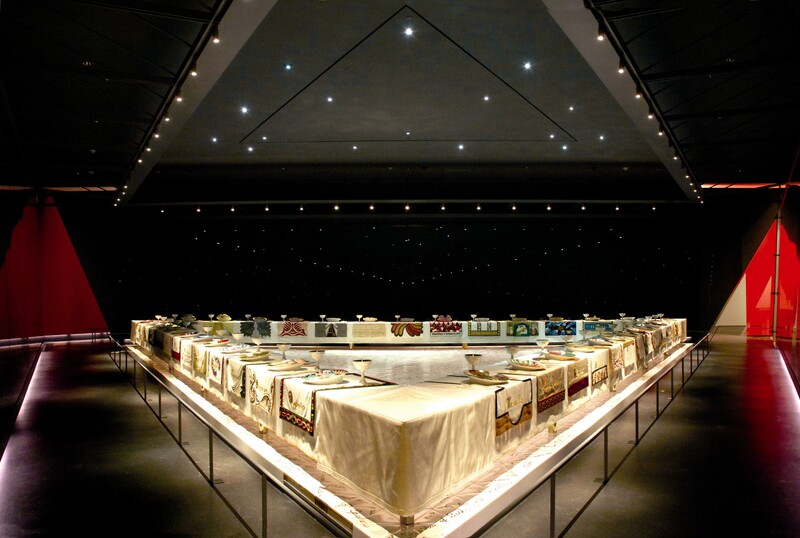 We built all these one-of-a-kind, fantastic displays throughout the century, but now, in the 21st century, the medium is electronic: computer-controlled light-emitting diodes; big video screens; the big pictorials printed by giant drum printers on vinyl. The art — or craft or trade — of painting is gone.” — Tama Starr…the third generation of her family to run Artkraft Strauss. On November 20th a number of Professor Neumann’s students presented research into the history of Times Square lighting and architecture atop the tiered, red steps of TKTS/Duffy Square. Then off we went, a group of about 20, into the thick crowds of a Saturday evening around 6:30 PM. One of my first observations were the pigeons foraging at night – when had I last seen birds on the sidewalk in a city? This is definitely a side effect of vast quantities of light. Observations of light and shadow in Times Square fall into a few categories; panels of LED and bracketed sign light, reflections and “borrowed effects”, few private or darkened moments, and massive application of animated, colored light. Private light is the largest contribution of brightness, street lighting is overshadowed (or over-brightened). Advertising panelized light sources create dense blankets of light. The key source of illumination are the billboards, both printed and LED direct-view. The light is cast obliquely, as if side-lighting a dance performance on stage. Reflections double the ad space in an eerie value-added move. Reflections of pixelated light are re-pixelated by neighboring rows of windows. Locating shadows: it is as if we, the visitors, are on-stage. 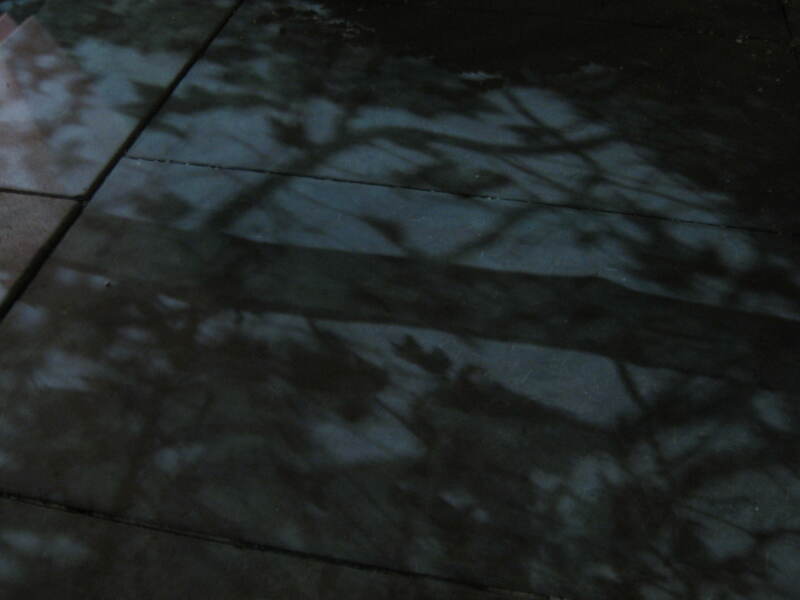 Cast shadows are noticeable on the ground plan and they are us… moving bodies. Primary shadows (that which “stick” to the object and give it form) are found only by concentrated and tenacious observation. Activities by street visitors include another media — cameras clicking, people posing, an altogether self reflective and reflexive, experience of light, commerce and ensuing happiness. We hope to redefine the role of light in the public space of Times Square for pedestrians. Times Square and the Great White Way, which is more Broadway and the theaters of Times Square, has a reputation for strolling. From the beginning of Times Square, there has been a legacy of social space and advertising. 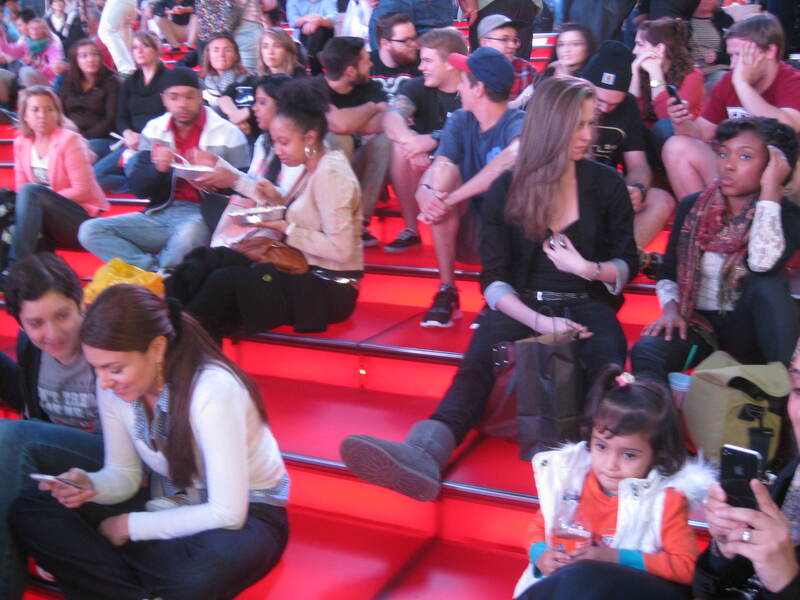 So, the rationale for Times Square has been continuous, but it’s also gotten overly-crowded. The differing objectives of cars and pedestrians has become rather adversarial. Here is another excellent resource, the book, “Times Square Spectacular; Lighting up Broadway“.